Each LAS file is examined to determine if its internal structure is consistent with the LAS specifications. If any LAS file fails to load into the LAS dataset, this may indicate the file is corrupted or has erroneous information in its header. Consider using Esri's CheckLAS utility to determine if some commonly encountered issues may exist in your data. Each LAS file typically contains spatial reference information in its header which is read by the LAS dataset. If this information is missing or improperly defined, the LAS file will not be placed in its correct location. If the correct spatial reference is known, consider using the Create PRJ For LAS parameter to create a .prj file that properly georeferences the lidar data. The .prj file will share the LAS file's name, reside in the same folder, and contain the well-known text representation of the LAS file's coordinate system, similar to the .prj file associated with a shapefile. The LAS files and folders containing LAS files that will be referenced by the LAS dataset. This information can be supplied as a string containing all the input data or a list of strings containing specific data elements (for example, "lidar1.las; lidar2.las; folder1; folder2" or ["lidar1.las", "lidar2.las", "folder1", "folder2"]). See Understanding tool syntax for more information on specifying lists for input. The LAS dataset that will be created. The spatial reference of the LAS dataset. If no spatial reference is explicitly assigned, the LAS dataset will use the coordinate system of the first input LAS file. If the input files do not contain any spatial reference information and the Input Coordinate System is not set, then the LAS dataset's coordinate system will be listed as unknown. Specifies whether statistics for the LAS files will be computed and a spatial index generated for the LAS dataset. 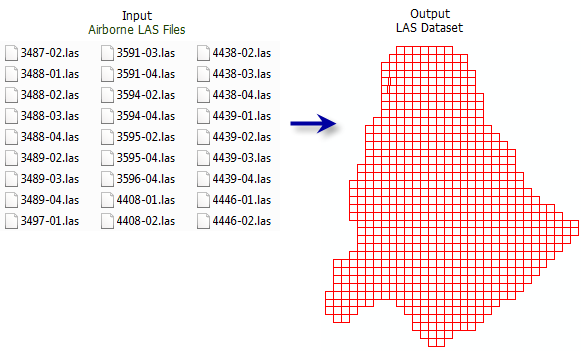 The presence of statistics allows the LAS dataset layer's filtering and symbology options to only show LAS attribute values that exist in the LAS files. A .lasx auxiliary file is created for each LAS file. Specifies whether lidar files and surface constraint features will be referenced by the LAS dataset through relative or absolute paths. Using relative paths may be convenient for cases where the LAS dataset and its associated data will be relocated in the file system using the same relative location to one another. ABSOLUTE_PATHS —Absolute paths will be used for the data referenced by the LAS dataset. This is the default. RELATIVE_PATHS —Relative paths will be used for the data referenced by the LAS dataset. Specifies whether .prj files will be created for the LAS files referenced by the LAS dataset. NO_FILES —No files will have a PRJ file created. This is the default. FILES_MISSING_PROJECTION —Only LAS files without a spatial reference will have a corresponding PRJ file. ALL_FILES —All LAS files will have a corresponding PRJ file.